Earlier this year LG released what they are dubbing ‘the Ferrari of solar panels’. This highly efficient solar panel has 60 cells, standard for a panel, but ranges from 350-365 watts of electricity- most panels on the market generate 260-300 watts. It has an efficiency of 20.3%, also much higher than average, which makes it one of the most powerful panels available. They call it the LG NeON R.
An extraordinary thing about these panels is that they come with a 25-year replacement product warranty, not to be confused with a the standard 25 year performance guaruntee. Currently no other brand offers this other than Sun Power. This warranty includes a full replacement warranty, which not only means LG will provide you with a new panel if it’s faulty, but send someone out to replace it free of charge. However, looking at their statistics, there is very little chance you will need to use the warranty. According to LG, currently out of the 400,000 LG panels installed in Australia, only 8 have had to be replaced. If you’re a betting person, this means that your odds are 1 in 62,500 chance of the panels failing over the next 25 years. 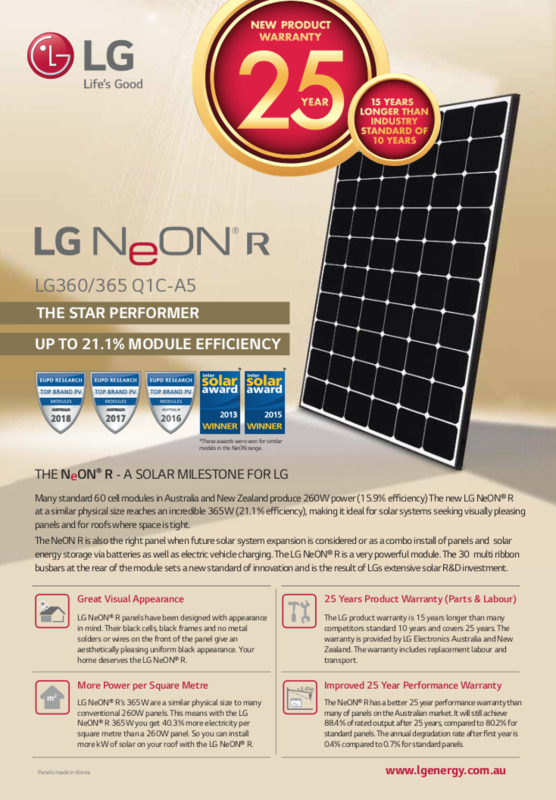 LG Neon R modules are an ultra premium solar panel, they perform exceptionally well in high temperatures and are a leader in module space efficiency. These panels are great for households with limited roof space and are ideal for people planning to expand their solar system, add batteries or charge an EV.